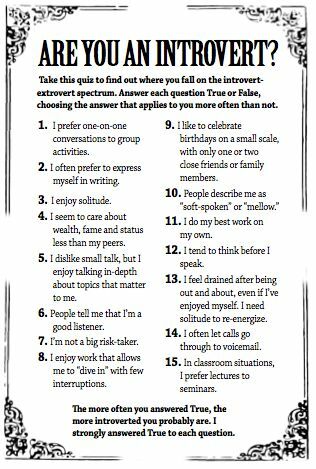 I’ve seen a flurry of articles, memes, and quotes lately about introversion — here’s an example from Pinterest. Once in junior high I made a valiant attempt to be outgoing — talked (to boys! ), laughed, joked around. It sort of worked — I think people were shocked I could speak. A “frenemy” (we didn’t know to call them that back then, but it SO applies to junior high girls) basically called me out for “copying” her…”Just because I talk and laugh and am friendly doesn’t mean you should.” She needn’t have worried — I think it lasted about a week. The majority of my friends are introverts (my husband is neither introverted nor extroverted, but a nice blend of both). We love each other, love to see each other and spend time together, but are just as happy to stay home. I have one dear friend who’s clearly not one of us. Outgoing, friendly, generous, open, speaks her mind (sometimes to a hilarious fault)…can talk to anyone anywhere and make an instant friend. She reached out to me on my first day of work and we’ve been friends ever since — me and a thousand other people. She is a people magnet. I still want to be her when I grow up, no matter how accepted introversion becomes. But do email me — I love to hear from you. Do talk to me on Facebook — I assure you I read ALL of your posts. Do tell me about your life — I’m a great listener. If you want to, ask me about my life. You might have to ask more than once and probe a little — I don’t like to bore people. Do get to know me — I make a great friend. And I’m a cool person. Finally. by kindred spirits,” said Marilla with a sniff.